In his cramped hut at the end of an alleyway in the coastal Tanzanian town of Bagamoyo, traditional healer Dr Msilo treats patients with a variety of mental and physical problems. 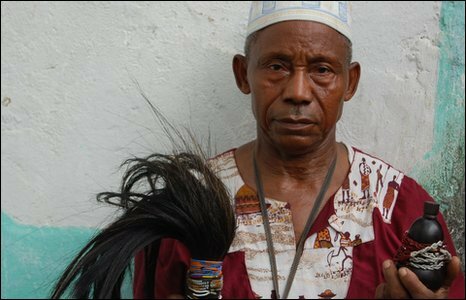 To locals, he is known as a witch doctor, and his treatments involve casting out evil spirits, as well as administering traditional potions. People are keen to seek out his services, regardless of their religious affiliation. "God provides medicine for all people - Muslims, Christians and pagans," he says. "They all know that the trees were given by God, and He gave some people the power to heal." The continuing devotion of many Africans to elements of traditional belief is well known. But Dr Msilo is just one example of a key trend identified in a major new study of African faith. The Pew Forum interviewed more than 25,000 people in 19 sub-Saharan countries about all aspects of faith and belief. The results show that the overwhelming majority of Africans in those countries are committed followers of either Islam or Christianity. But alongside regular visits to church or mosque, they will also visit traditional healers like Dr Msilo, who offer a connection with the ancient beliefs that pre-date Christianity and Islam in Africa. The survey underlines that in most countries, Christians and Muslims live peacefully side by side. Fewer than one third of respondents felt religious conflict was a problem in their country - though 58% said it was in Rwanda and Nigeria, where there have recently been clashes between rival communities around Jos. Where tensions grounded in religious difference do exist, there is a strong correlation with ethnic divisions - as was the case in Jos. Christians are more likely to regard Muslims as violent than vice-versa. On average, more than 40% of Christian respondents associated violence with Muslims, whereas 20% of Muslims associated violence with Christians. A key concern identified was the lack of understanding that both Muslims and Christians have of each other. At a recently established Muslim-only school in Bagamoyo, teachers were struggling to obtain adequate resources. They compared their facilities with those of Christian schools that attract funding from foreign missionary organisations. Deputy headmaster Abgala Maropia said that in spite of this inequality, there were generally no tensions between Christians and Muslims in the town. Download comes from Pew Research Center website. "Here in Tanzania honestly we don't mind whether one is Muslim or Christian - we live in peace and harmony," he says. But other teachers admitted they knew very little about Christian beliefs, and they acknowledged this can lead to misunderstanding. It is clear that religion is a defining part of most people's life. At the fish market, a Muslim women explained that of course she attends prayers five times each day. She seemed to find it strange that she was even being asking about the significance of religion. The Pew Forum study found that 93% of people in Tanzania said religion was a very important part of their life. Both Muslims and Christians would like to see their own religion exerting legal influence within their country. Some 63% of Muslims favour the implementation of Sharia law, and just over half believe the Caliphate (the unification of the Islamic world under a single ruler) will be re-established during their lifetime. One of the most consistent Christian responses across all 19 countries concerns the return of Jesus Christ to earth, with 61% believing it will happen in their lifetime. But there is also significant concern about the impact of secular influences - particularly Western media. While most believers admit to enjoying Western film, music and television, there is real concern about its impact on morality. In Tanzania, 80% of respondents believe that morality has been undermined by such entertainment. Getting a wholly consistent picture from such a wide-ranging piece of research is unlikely. But the Pew Forum's study underlines the substantial influence of both Christianity and Islam in the countries surveyed. As sub-Saharan Africa looks to the future, an intriguing attachment remains to the traditional beliefs that many Christian and Muslim leaders condemn. Though it may be that influences from beyond Africa, not least those available through the power of the internet, may yet contribute most to changes in the religious landscape in future.